This is an artist's concept of NASA's OSIRIS-REx spacecraft preparing to take a sample from asteroid Bennu. If you have any predictions about the state of space exploration a decade from now, NASA would like to hear them. The space agency is inviting the public to contribute messages and pictures to a "time capsule" aboard the Osiris-Rex spacecraft, which is scheduled to launch in 2016. The probe will collect samples from an asteroid and return the material to Earth in 2023. 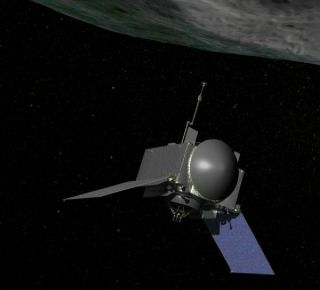 "Our progress in space exploration has been nothing short of amazing," Osiris-Rex principal investigator Dante Lauretta of the University of Arizona said in a statement. "I look forward to the public taking their best guess at what the next 10 years holds, and then comparing their predictions with actual missions in development in 2023." If all goes according to plan, the $800 million Osiris-Rex mission — whose name is short for Origins-Spectral Interpretation-Resource Identification-Security-Regolith Explorer — will rendezvous with the near-Earth asteroid Bennu in 2019. .
Osiris-Rex will spend more than two years at the 1,760-foot-wide (500 meters) space rock, eventually collecting at least 2 ounces (60 grams) of material from Bennu's surface. These samples will be sent to Earth in a return capsule, arriving home in 2023, along with the messages and images inside the time capsule. Studying the asteroid material should shed light on the solar system's earliest days and help scientists better understand how Earth came to possess the raw materials necessary for life — water and carbon-based organic chemicals, NASA officials said. The Osiris-Rex mission will also help NASA prepare for its bold asteroid-capture mission, agency officials added. This effort aims to drag a near-Earth asteroid into a stable orbit around the moon, where astronauts would visit it, perhaps multiple times. The first such manned trip is scheduled to occur by 2025, to meet a deadline imposed by President Barack Obama in 2010.